What do multi-award winning comedian Tina Fey and serial innovation companies 3M or W.L. Gore have in common? They wholeheartedly say <strong>“Yes, and…”</strong>. 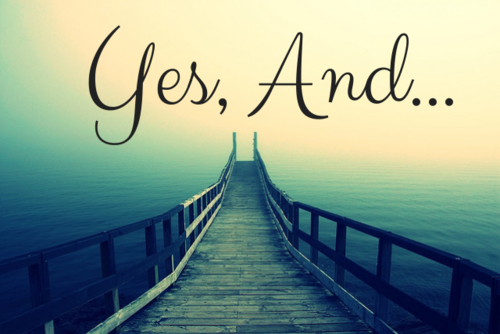 “Yes, and…” is one of the most powerful and successful mental models and business practices I have ever come across. It is very different from “Yes, but…” and takes you to spectacularly different outcomes. This client’s story tells you why and how. Tom didn’t sleep well during the weekend and shared this astounding insight with his partner. He admitted that he also did it a lot at home, and with the kids, and so did she. They suddenly saw “Yes, but…” for what it is – a “No” that you are either too lazy or not bold enough to state, mainly because you want to avoid conflict or because you think you are right and the other is wrong. “Yes, but…” is the death of open dialogue and of high-quality inquiry and advocacy. Moreover, it is a horrendous time killer. Then Tom observed everyone else for a week and counted in his notebook how many times “Yes, but…” was used around him. Well, he actually stopped on Wednesday afternoon when he reached 500 “Yes, but…” counts, and couldn’t bare it anymore. He stopped his own team’s weekly meeting to ask his 7 people to ask themselves what is really going on: Are we listening to each other? Are we working towards a shared goal? Are we appreciating each others contribution? The dire answer was no. He then explained to them what he learned on the programme and in every meeting for the next few weeks he ran the same fun little exercise with his team. He then reflected with them and together they concluded that “Yes, and…” has impact on three levels: self, team and the wider organisation. At the level of self: “Yes, and…” puts your ego in its place, because it stops that chatter in your mind about what you want to say next while your colleague is still talking; quite simply, it forces you to let go of your assumptions, and instead go with the flow. At the level of team: the change was immediate, instead of torpedoing their ideas in those classic “brainstorms” (think about the potential damage of ‘storms’ for a moment…) they are now better at co-creating solutions together, where each person is laying one brick on top of another, building strong foundations for whatever they wanted to create. At an organisational level: Tom and his team realised that when a few hundred people operate in the “Yes, and…” mode, the potential becomes exponential, with outrageously creative and impactful solutions becoming the norm rather than the exception. For that answer we have to go back to its source, Tina Fay, or rather the Chicago School of Improv Theater, where “Yes, and…” is a core technique that stand-up comedians have to practice for years. One actor throws a sentence at you, and the other one needs to pick up the ball, enthusiastically appreciate the idea with a resounding “Yes, and…” then add their wacky idea to it. This is how the best-improved comedy comes to life, literally out of thin air. Innovation itself is – among other key ingredients and practices – the art of taking something from a seemingly unrelated world that is ideally far away, and bringing it to your problem. Hence, at least this is my conclusion, why this simple exercise had the biggest impact on our IT Manager Tom. Count how many times “Yes, but…” is used in meetings and call them out once you hear them 3 times in a relatively short period of time.